The famous Ski Boy is a girl! The boy in Osmo K.Oksanen’s famous travel poster Ski Boy is in fact a little girl! The young Mari on her way on winter holidays, with her skis and suitcase. The Ski Boy is one of the most famous posters Oksasen made for the Finnish State Railways. For the poster, made in 1957, Oksanen had his youngest daughter modelling – carrying skis and her mother’s makeup case. The daughter is wearing a duffle jacket, which was a souvenir from a business trip to Italy in 1952. The parents had brought their three daughters beautiful red jackets that were selldom seen in Finland, and the daughters loved to wear them for skating and skiing. There is also a summer version of the poster, The Umbrella Boy, modelled by a boy who lived in the house in Helsinki where Oksanen had his studio. Oksanen was an eager drawer already at a young age and he would always be drawing on any piece of paper he found. Luckily his mother was a shopkeeper, who always had maculature paper in her dress shop. Oksanen had only gone to middle school before his art studies. He was an eager sportsman who cycled and boxed. He worked for several places such as at the telegram office delivering messages all over Helsinki. He started his studies at the Academy of Fine Arts in Helsinki 1936. The war made everything more complicated, and in between his studies he was on service in the air defence. He would later tell his children how they sometimes would go to the cellar during the bombings of Helsinki and sit with pieces of art in their laps, protecting them. Once in the bomb shelter he was protecting an Auguste Rodin sculpture. He drew a lot during this time and many drawings from the war years are still intact. Oksanen met his wife Sirkkaliisa (née Rautava) during the studies and they married in 1945. Sirkkaliisa studied fine arts pedagogy and later changed into ceramics. However, she never worked as an artist, but stayed at home taking care of the household.Oksanen graduated from the Academy and already early in his career he made many successful film posters. In 1945 the Oksanen family moved to Rauhankatu in Helsinki which was located close to the studios of the Finnish Film Industry. Those days he also designed opening texts for films, using the same typography and style as in the posters. In 50’s Oksanen also founded a studio and business with another advertising artist, Raimo Raimela. The studio was situated on the street level and had large tables. They worked for the Finnish film industry (Suomi-Filmi, Suomen Filmiteollisuus and Fennada) making posters and advertisements in very large sizes. Each advertisement would have to include the name of the film and naturally the names and faces of the two leading actors. “I would often follow my dad to the studios. They started this particular work by magnifying photographs and then drawing the outlines. One had to be a skilled painter to be able to make good posters. The posters were gigantic and they were set up on the roof of the BioRex theatre in Helsinki”, one of his daughters tells us. Oksanen’s most popular film poster is, of course, the one for Unknown Soldier from 1955. When drawing the poster he asked an accidental actor to lift up a machine gun, so that he would get the right angle of the body. He had been requested to make a poster with a machine gun. 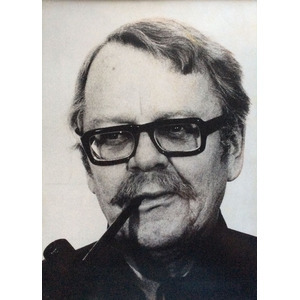 Little did he know that this man would depict the character of Lahtinen. Neither did he know that the actor, Veikko Sinisalo, would become famous. Oksanen moved his studio form Topeliuksenkatu in Töölö, to Wallininkuja in Kallio. The daughters spent much time at the studio. The oldest daughter has fond memories and the smell of poster paint reminds her of her father. Film posters were the work of the early career. It was by chance that he started to work for the State Railways, as someone had seen his work and asked him to come over. Later on the advertising manager of State Railways, Mr Igor Ahvenlahti, also a travel poster artist, became a good friend and a family friend. In addition to posters, Oksanen had other commissions for State Railways such as designing the centennial jubilee train. During the centennial commission Oksanen had a studio opposite the main railway station, in the Skoha house, in Helsinki. In 1956 the Oksanen family moved from the city to Marjaniemi, a residential area by the sea. They had a house with a studio but Oksanen would still do most of his work in town. He would not always be satisfied with the printing results, and would not sign all posters – the pace was quite hectic in the film industry. The poster of Punainen viiva/The Red Line (based on the novel by Ilmari Kianto) is an exemplary piece to show how talented Oksanen was. Humour can be seen in many posters but not all suggestions were accepted. This was the case with a safety campaign at the State Railways in 1960’s for which Oksanen submitted a poster. The poster depicted the rail and a large red spot with ”He walked on the rail”. In the 50’s Oksanen made a car trip to Europe, which was rare in those days. Two advertising artist, Oksanen and Raimela, set off with their wives to drive through Europe to the Biennale of Venice and the Triennale of Milan. Travelling was not common those days and e.g. a special permission was needed to be able to get foreign currency. The trip was, of course, a quest for inspiration. Oksanen had interns at the studio and some would be accepted to the School of Fine Arts. One of these artists grandmother was a baker by profession. She was very grateful to Oksaen and would see that the Oksanen’s never run out of shortbread. This would not be disclosed to the young artist. ”Dad was drawing all the time. He had a pencil in his hand and he would be sketching and doodling away, working on ideas for advertisements and what not. In a way he was always at work, and it was only during the last years when started to slow down”, the oldest daughter tells us. Artistic talent runs in the family. Everyone can draw, and one of the daughters is an art teacher and another is an artist living in Denmark. Cycling remained close to Osmos heart and the family also skied much. The skiing tracks of Herttoniemi, Helsinki, were popular in the family and the Winter poster for the State Railways, one can clearly see the wife skiing. However, Oksanen never wanted to visit Lapland after the war. Oksanen continued to draw in his house in Marjaniemi. He had very relaxed about his work, hard-working and he would gladly have others to use his pictures for others to use. Oksanen died at a relatively young age of 62. Interview, Ulla Forstadius ja Hannu Jokipaltio, 25.1.2016 & ”Come to Finland. 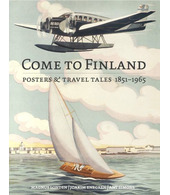 Posters & Travel tales 1851-1965”.